Kilauea Caldera with the glow from the lava lake in Halemaumau Crater. Photo by Baron Sekiya shot January 4, 2016. 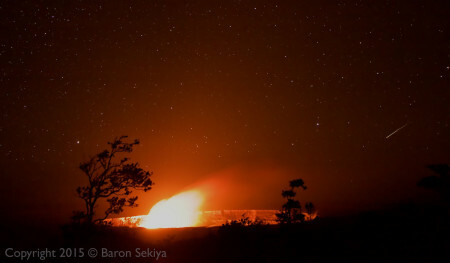 A shot of Kilauea Caldera with the glow of the lava lake in Halemaumau crater as a shooting star in the sky on the right. Maybe it was a meteor or a piece of space junk I’m not sure. Meteor, space junk, either way – nice photo! How often do you have that opportunity to take a photo with a shooting star/space junk streaking in the sky? I for one have not had that opportunity!